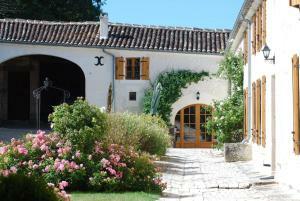 This Relais is located on the slopes of the Grande Champagne vineyards, 20 minutes from Cognac. Guests have free access to the outdoor pool, fitness centre, tennis court and children's playground. The Saint Preuil Relais offers spacious rooms, suites and apartments featuring views of the vineyards and including modern, private bathrooms. Free WiFi access is provided both in the rooms and the surrounding gardens. Breakfast is served daily and the Saint Preuil’s restaurant serves regional cuisine, accompanied by local wines, only upon prior reservation 24 hours in advance. You can also enjoy Cognac tasting. The Relais also provides a bicycle rental service and barbecue facilities. Free private parking is provided at the Relais De Saint Preuil. Guests can also enjoy tours of the fine Cognac distilleries located nearby.